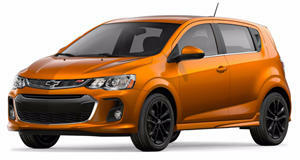 Chevy is going sky-high in their new Sonic. Chevrolet is pulling out all the stops in their new advertising campaign for the 2012 Sonic. As part of their "Let&apos;s Do This" marketing run, they have previously taken their new Sonic bungee jumping and now skydiving. The stunt, which took place on September 22nd in the desert of Arizona, used 22 cameras including special super-slow-motion software. Chevy is marketing their Sonic to a much younger demographic than the rest of their models. That means &apos;extreme&apos; stunts are apparently necessary as well as a social media game where participants have the chance to win one of 10 Sonics. In order to win a new car you must take a video of yourself and upload it online doing one of a series of wacky stunts. Check out the new 2012 Chevy Sonic rolling out of a plane sky-high in Arizona below.